Who Ate All the Hor d’Oervres? Home / Who Ate All the Hor d’Oervres? Here we are just weeks from Thanksgiving. Can you believe it? Where does the time go? Rhetorical question I know. I’ve been a little busy which has put me behind in so many things. I promise, I’m catching up!!! Our new format is going to allow me to catch up and stay caught up and do more. Yay!! I can focus. It has become a tradition to have a two-day class Thanksgiving weekend Saturday and Sunday; it’s a small break at the beginning of the crazy holiday season. 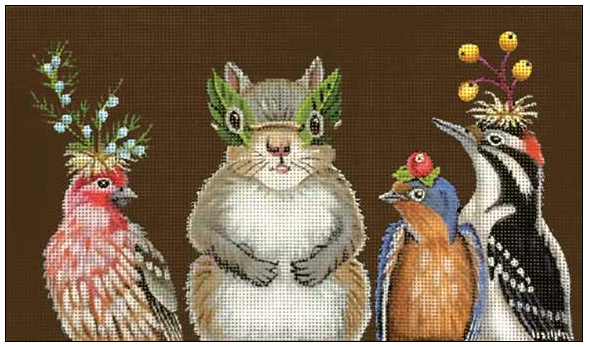 It gives us a chance to spend time together stitching and simply enjoying each other’s company. This year I will be teaching the class and the project so appropriately is Who Ate All the Hor d’Oervres? by Vicky Sawyer and Melissa Shirley! The canvas isn’t too large is’t 12 x 7 on 13ct. Should stitch up fairly quickly. Don’t you just love the bird hats. They are going to be the most fun. My classes are relaxed. I have a plan. There will be a stitch guide. We will play and stitch together. It will be a fun two days. Check your calendars. If you can get away for a day or two, we’d love to have you. I have a few spaces left. Call us at 410.296.0405 to reserve your spot.